It’s showtime for desert wildflowers in CA, AZ and NM. But in Utah’s deserts think April or May. Within those months the exact timing, type and quantity of blooms are highly variable. Flowering depends upon the pattern of precipitation from fall onward and on spring temperatures, sunlight and elevation. And of course, on the specific ecological requirements of each particular plant. Annuals are plentiful in the desert. Annual plants germinate, grow, flower, set seed and die all within one season—often in the spring. To avoid water stress—some annuals will start their life cycle only when there is significant moisture. If it’s dry, they may stay in seed form waiting for better conditions. Likewise, many perennials—plants that live more than 2 years—can remain below ground as dormant bulbs, corms or roots. But when conditions are right, these water stress avoiders –both annuals and perennials–will flourish. When this happens we call it a “good year” for wildflowers. I couldn’t find a wildflower hotline for Utah—so I called different parks representing Utah’s 3 different desert regions to get a flower forecast for 2013. Nothing much is happening yet on the Colorado Plateau in and around Arches and Canyonlands National Parks. It’s been pretty cold according to staff ranger Sharon Brussell. So the appearance of spring flowers is somewhat delayed. But in April we can expect to see evening primrose, twinpods and milk vetches. And in late April-early May, Princes’ plume, globemallow and yucca. 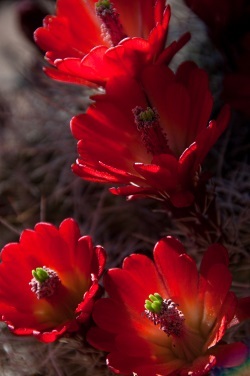 The scarlet blooms of claret cup cactus will follow. If you miss what you are looking for in Arches or the Needles district, just go higher to Islands in the Sky, adds Nathaniel Clark of the Canyonlands National Park. Here–because of the elevation–flowering of similar species occurs 2-4 weeks later. Snow Canyon is in the Mojave Desert region. Park Manager Kristen Comella told me that this is likely to be a typical year for wildflowers. Spectacled pod and lotus vetch are already out. Soon we’ll see bright yellow flowers of the Mojave’s signature creosote bush, and the deep purple flowers of indigo bush. Prickly pear and Utah yucca will soon follow. If you want to see early spring blooms on Joshua trees, go south on old highway 91 from Gunlock to see Utah’s one and only Joshua Tree forest. To find out what’s happening in the Great Basin I spoke with Ben Roberts at Nevada’s Great Basin National Park. He says there has been a bit less precipitation than normal but it should still be an OK year for flowers. So far he’s only spotted one — Nevada lomatium. This brave little plant blooms even when there is snow still lying around. From a distance you might even think the low-lying white flowers are a patch of snow. In April desert paintbrush will appear, as will arrow-leaf balsamroot and purple sage. Wild iris, blue flax and prickly pear will follow in May.